Yes I am very late in posting this. Holidays, three seminars back to back, work. What can I say. I was drafting it, just didn’t get a moment to post it. 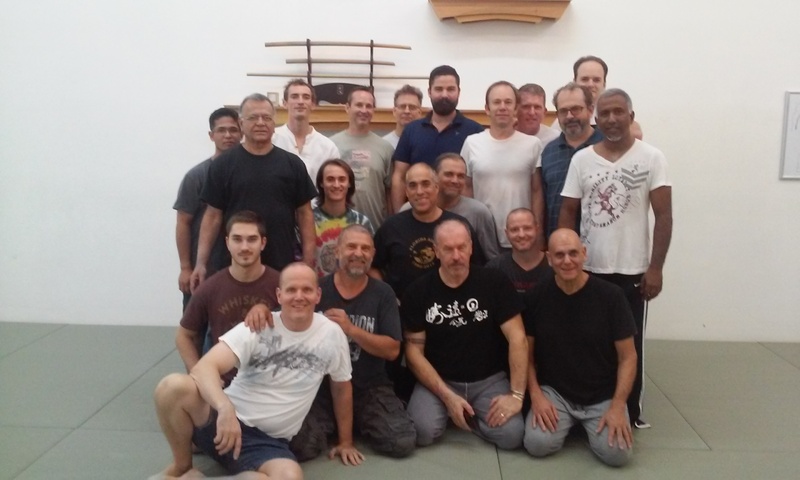 Anyway, Dan Harden came down to Randall Smith’s dojo, Aikido of Palm Beach County, for a seminar. Let me sum it up in one word: Awesome! It’s always great, on many levels, engaging with Dan. Besides the marital training aspect, he’s just a wonderful person to talk to. He speaks his mind and can back up his opinions with fact. It doesn’t get any better than that. I argue for a living, so I know. Plus, we have a great group of practitioners who always show up for Dan. And its always time well spent with them. Looking at the picture above, you can see we are not pretty, but we are effective. Let me insert a disclaimer before I launch into my learning experience with Dan. What I post on here is strictly my interpretation of what I learned from him. It may be right and it may be wrong. The memory has a funny way about remembering things exactly as they happened. If you want authentic training, seek out Dan at one of his seminars. You can get more info at Bodyworks Seminars. Now on to what I learned this last time with Dan. We went over some of the core principles. This is a necessity. I need to have the basics constantly drilled into my head. The basics being spiraling, bowing, center, and all directions. If you don’t have these, you got nothing. Dan tested us on our knowledge and use of the basics. Yes, he tested us. Dan had us all stand, lengthen our spines, and extend energy in all directions. He then came around to each one of us and gently pushed to see who would topple over. Of course, I caved. I didn’t have it. And I think all but three of us failed. After Dan determined who didn’t have it, which was the bulk of us, he had us re-align ourselves and concentrate on accessing from the center. It worked like a charm. We all held steady upon the attempt to push us off balance. Sounds like small stuff. But its essential. Without understanding the concept of extending your energy in all directions, you can’t move onto more complex things. For me, practicing this exercise, extending energy in all directions, actually has the feeling of stretching my fascia in conjunction with feeling my center. The two are connected. Dan showed a us a new exercise that I have since implemented into my daily solo training. Its this really cool bicep spiral training exercise. The idea is to stand straight, aiming your biceps straight ahead, gently closing your fists with your index finger pointing forward. Its important to have your biceps and index fingers lined up in the same direction and to keep them that way during the exercise. So after you get lined up, you concentrate on moving only your bicep muscle. You spiral it to the outside and then back. Its important to make sure its your biceps moving and not your index fingers. I have been practicing this since I learned it. The effect is that it has given me a better understanding of bowing and shoulder movement. Its subtle and powerful. I can’t elaborate on the quotes because there is no elaboration. There is only the processing of their meaning. I think it would be appropriate to start referring to Dan quotes as “Danisms”. For anyone interested, Dan is scheduled to come down to Aikido of Palm Beach County on January 29, 30 and 31 for an Internal Power Development Seminar. For more information contact Randall Smith. I can’t wait to train with Dan some more. I consider myself extremely lucky to have such continued and consistent access to him. what is spiraling and bowing? I just posted new content that deals a little bit on bowing.